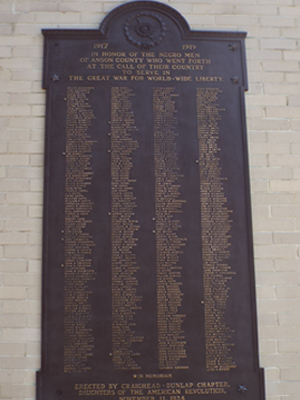 A rectangular bronze plaque mounted to an exterior wall of the Anson County Courthouse lists the names of African American men and women who served during the Great War. A wreath with a quote underneath is engraved above the names. 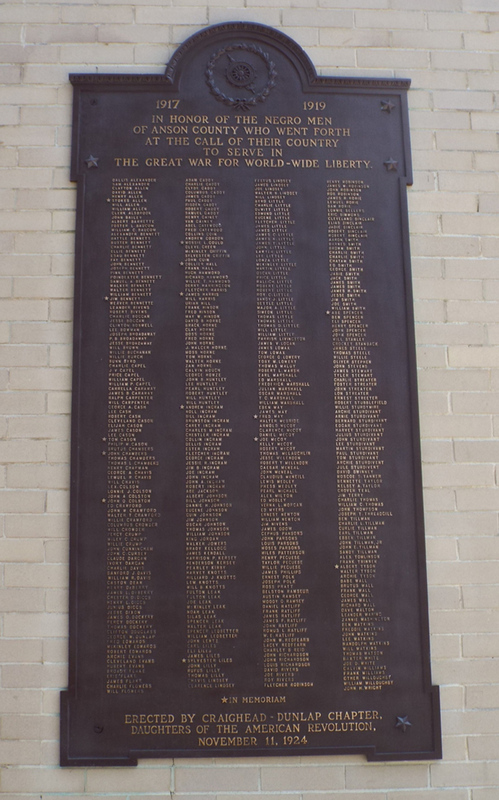 A similar bronze plaque lists the names of white men and women who served during WWI. Bottom: IN MEMORIAM / ERECTED BY CRAIGHEAD – DUNLAP CHAPTER, / DAUGHTERS OF THE AMERICAN REVOLUTION, / NOVEMBER 11, 1924. This plaque follows Jim Crow practices by having a similar plaque listing the names of white soldiers who served. The Anson County Courthouse is located on N. Greene St. between East Martin and East Wade Streets. The bronze plaque is mounted on the exterior wall of the entrance to the courthouse, a few feet to the left of the front doors. A companion listing for white men and women is mounted on a similar plaque, on the right exterior wall.